Scope of Project: Replacement of concrete pavement, inlets, trench drains, drainage pipe and pavement markings. 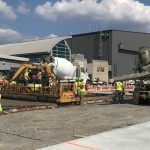 of numerous drainage pipe/valves up to 84” diameter, and installation of over 60,000 SY of airfield concrete pavement. 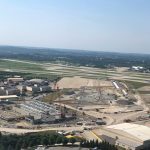 Scope of Project: As a subcontractor, Golden Triangle will be responsible for the excavation, installation of drainage facilities, subbase, and installing over approximately 38,000 SY of pavement in accordance with USACE specifications. 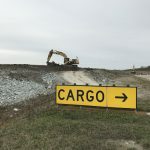 Scope of Project: The extension of Cargo Ramp 3 to accommodate larger aircraft which included excavation, drainage improvements, detention facility installation, asphalt paving on taxiway, and concrete pavement of the cargo ramp area. 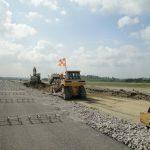 Scope of Project: Replacement of concrete slab and base course on re-compacted subbase of approximately 500 LF of runway and also associated taxiways. 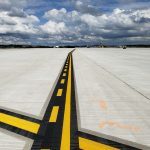 Also included full depth runway shoulder, minor grading modifications, installation of a new under drain system, and removal and reinstallation of drainage structures.